Description: NS 58 pulling wooden boxcar and N&W safety car over Kilbourne St. Description: Pulling across Kilbourne St. Title: NS 58 @ York St. Description: Pulling west from York St. Description: Just east of Kilbourne St. Title: NS 58 crossing Southwest St. 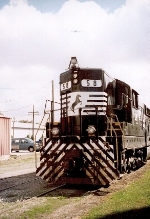 Title: NS 58 heading toward Kilbourne St. Description: NS 58 pushes a set of power back to the shop in the early morning sunshine. Description: An unusual sight in 2006! 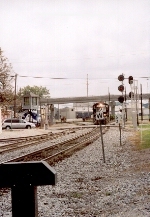 A pair of SD9M's are working Glenwood Yard in Raleigh, N.C.